Easter is a wonderful time to celebrate the coming of Spring time. This means new flowers, warmer weather, and bright and fun colors! 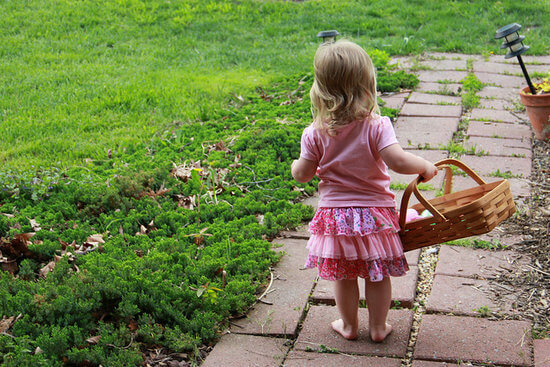 Easter is one of the most fun holidays of the year to celebrate with your family, especially if you have young children who will be hunting for Easter Eggs. 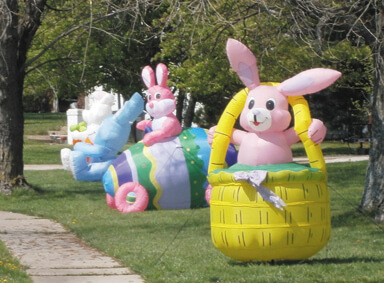 What better way to decorate your lawn for this day than with some of the best yard inflatables for Easter? 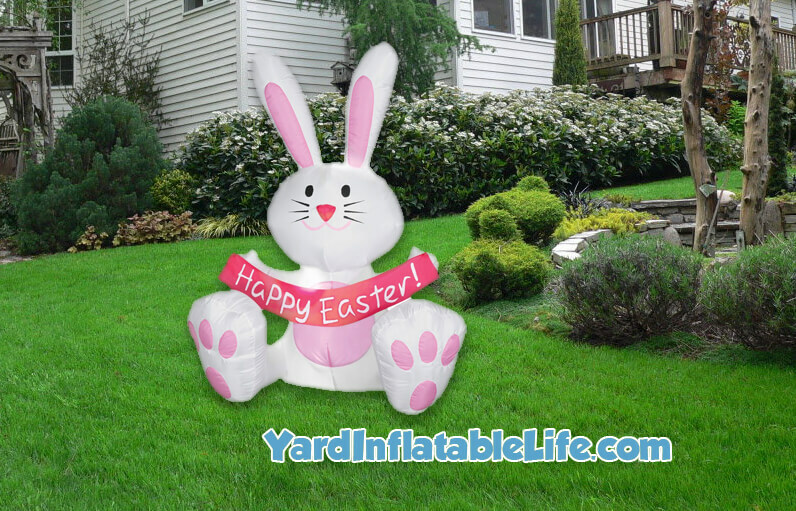 Why Get Easter Yard Inflatables? Easter is a holiday that doesn’t have as much traditional decorations like Halloween or Christmas. You shouldn’t let that stop you though, as Easter is such a fun holiday with great imagery! Whether it’s an Easter Bunny, or a baby chick, these cute animals mixed with pastel colors will make your Easter of 2016 one to remember. Especially if you’ll be spending time outside for an Easter egg hunt, the kids will love your decorations. What’s also unique about yard inflatable decorations is that they’re lightweight and easy to move around. Even though they make a huge impact once inflated, they deflate just as easily to take up minimal room when in storage! This gives them a major advantage over traditional decorations. 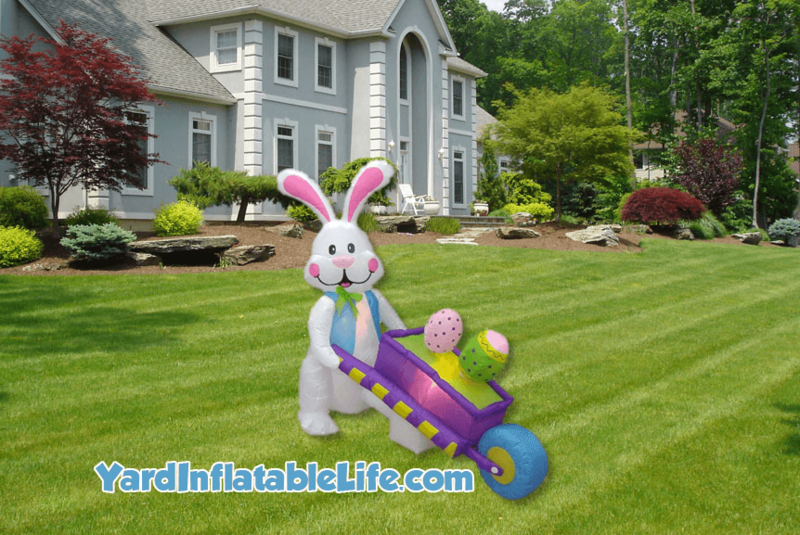 For those of you looking for an Easter bunny yard inflatable to decorate your yard with this year, we put together a list of the best options available. 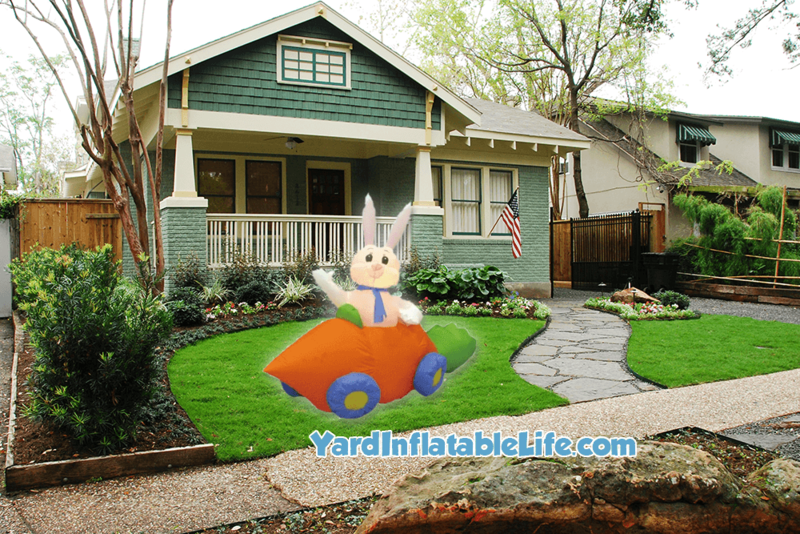 Kids love to see an inflatable Easter bunny during their Easter egg hunts! You won’t be disappointed. 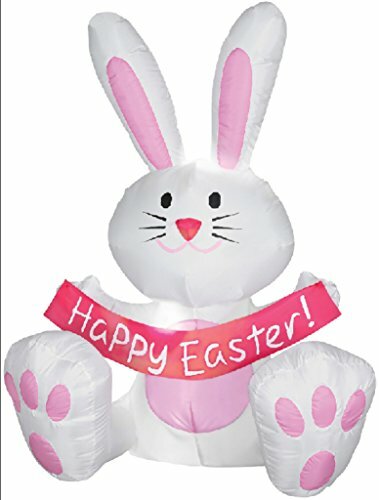 If you’re looking for a pretty safe and simple Easter yard inflatable, look no further than this Easter Bunny with a “Happy Easter” banner. It’s 4 feet tall at the top of the ears, which makes it approachable for younger kids. It comes with stakes to tether the inflatable securely into the ground, and a 6 foot power cord to run the fan that inflates this decoration. 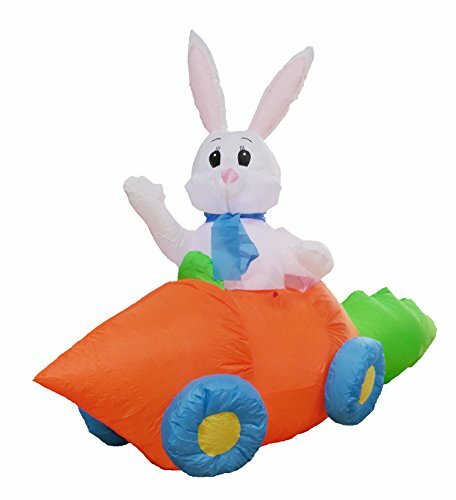 For those looking for a comical yard inflatable for Easter this year, look no further than this bunny in a carrot car! It’s sure to get a laugh from your friends and family, and kids will adore it. It measures 59 inches long, 28 inches wide, and 48 inches tall. This inflatable self-inflates and has LED lights inside so it lights up at night as well! It also comes with equipment to secure it to the ground, great for indoor or outdoor use. 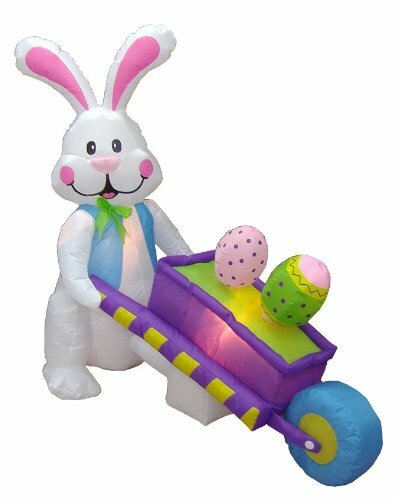 For another Easter yard inflatable that’s sure to delight, check out this Easter Bunny pushing a wheelbarrow with Easter eggs! This yard inflatable plugs in to self-inflate, and comes with ground stakes and tethers. It also lights up, and is 57 inches long by 27 inches wide and 48 inches tall. It’s hard to be sad around this happy yard inflatable. Finally, if you’re looking for an inflatable that you can give out as a gift and let a child tug around, look no further! 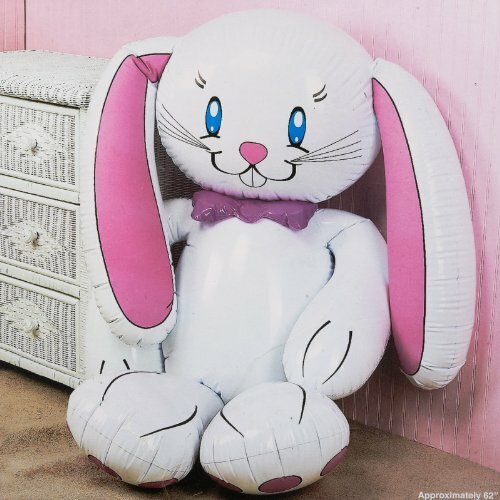 This jumbo-sized Easter Bunny inflatable makes a great kids’ companion as they run around the yard looking for eggs. It’s about 5 feet high, and you’ll likely want an electric air pump to assist you in getting this one inflated.